Albufeira, located on one of the finest parts of the Algarve’s rocky Atlantic coast, is the internationally most renowned holiday destination in Portugal. Long sandy beaches alternate with small bays, protected by bizarre rock formations and grottoes. Holiday makers can choose from hundreds of hotels, first class resorts and private residences of all categories. The lower town of Albufeira with its bars, discos and night clubs is the most popular hot spot on the Algarvian coast. The marina of Albufeira is a centre of water sports and excursions by boat, golfers will find all year excellent conditions on the many golf courses in the surrounding area and the mountainous hinterland invites for excursions or a hike. Albufeira is located on the rocky coast of the Algarve between Vilamoura to the east and Armação de Pêra to the west. Albufeira is a city (cidade) and municipality (concelho) in the district of Faro (Algarve). Conveniently located on the coast approximately 30 minutes drive from Faro Airport, Albufeira is one of the most popular holiday destinations in the sunny Algarve, the most southern region of continental Portugal. Albufeira is easily accessible from the A22 motorway and the National Road EN125, Lisbon is only a couple of hours away via the A2 motorway. The Algarve is serviced by a single-track railway line, Linha do Algarve, which runs from Lagos in the west to the Spanish border in the East. The station is located on the outskirts of Albufeira in the village of Ferreira. The busses of the EVA Transportes offer a good service throughout the Algarve and further afield, and are more centrally located than the train station. Holidaymakers have the choice of hundreds of different properties in Albufeira and the surrounding area. Our offers include hotels of all categories, holiday resorts with apartments, town houses and villas as well as private properties - at guaranteed best prices. Many of these hotels and resorts stretch along the coast between Vilamoura and Albufeira on the beaches of Inatel, Praia da Oura, Santa Eulalia, Olhos de Água and Falésia. West of Albufeira, between the marina of Albufeira and the tourist centre of Armação de Pêra many more hotels and resorts are situated on top of the cliffs, overlooking small rocky bays and the beautiful sandy beaches of São Rafael, Castelo and Galé. Golfers will appreciate the direct access to the associated golf courses of the Sheraton Algarve Hotel and Pine Cliffs Resort, the Balaia Golf Village and the hotels in Salgados. If you prefer to stay closer to the picturesque old town of Albufeira to enjoy the vibrant atmosphere in the narrow lanes or to experience the night life on the famous “Strip”, you will find many hotels and apartments along the ring road Av. dos Descobrimentos, encircling the city centre, offering beautiful panoramic views towards the marvellous bay of Albufeira. One of the most popular apartment hotels there is Paraiso de Albufeira. The boutique hotel Vila Joya in Galé is one of the most exclusive and beautiful places of its kind not only in the Algarve but in the whole of Portugal. It used to be the holiday home of a German business consultant, who named it after his wife Joy. Situated on one of the finest beaches on the craggy Algarve coast, it is famous for its two star Michelin restaurant, and named as one of the top 50 restaurants in the world. More than 25 superb beaches, many of them recognised for their quality with the distinguished Blue Flag by FEE, entice holidaymakers to swim and walk and enjoy a wide range of water sports. These long sandy beaches often extend for several kilometres and have rock pools and caves to enjoy. The new purpose built marina, located in an artificial basin on the western edge of the city, was opened in 2003 with a capacity to moor nearly 500 boats. A very special attraction, particularly for families with children, is located on the EN125 in Guia, not far from Albufeira. A visit to the amazing theme park Zoomarine, is a must. See the fantastic dolphin and seal shows, plus many other displays, and enjoy all the rides available and use the swimming pool. It is also possible to book in advance and swim with the dolphins there. Some of the finest golf courses in the Algarve are only a short drive away: the names of Vilamoura, Quinta do Lago and Vale do Lobo make the heart of every golfer beat faster. A very special challenge is the Salgados golf course in the lagoon of Armação de Pêra, with water hazards on every hole to play. The narrow streets of the lower old town are filled with shops and street vendors that offer souvenirs and beach accessories. In the summer months, it is worth taking a stroll through the pedestrian zone with its pubs, bars and restaurants to drink into the special atmosphere of this bustling city. One of the largest of its kind in the Algarve is the Algarve Shopping commercial centre at Guia on the EN125. Over a hundred shops, a supermarket and numerous restaurants are spread over two floors. Apolonia supermarket in Galé carries a huge selection of regional and international specialties and world famous brand names. Albufeira is surrounded by some of the best known beaches from Praia da Falésia in the west to Praia de S. Rafael in the east. A few kilometres east of Albufeira is Pine Cliffs, one of the finest golf and holiday resorts in Portugal. The resort features the 5 star Hotel Sheraton Algarve, luxury apartments and houses of different sizes. Also featured are a children's club, swimming pools, an indoor pool with gym and spa, plus a separate 9 hole golf course. The tee shot on the "Devil's Parlour" on the red sandstone cliffs of Praia de Falesia is one of the most spectacular in the Algarve. Going west from Albufeira you come to the delightful village of Galé. Here you will find the fabulous 2 Michelin star restaurant Vila Joya, an absolute must for gourmets. In 2013, its profile reached an even higher level when it was included in the category of the 50 top restaurants around the world. Once a year, the chef, Dieter Koschina, invites his friends, top chefs from around the world, for a week long extravaganza. Further inland, 12 km north of Albufeira is the village of Paderne. The ruins from the Moorish castle, which was built high on a rock overlooking the valley of the River Quarteira, are still visible today. From there you have a magnificent panoramic view of the area down to the coat. A beautiful hiking trail leads through the valley of the river Ribeira de Quarteira. The river originates in Alte and flows out into the Atlantic at Vilamoura Marina. The origins of Albufeira date back to the prehistoric period. Later it was settled by the Romans, who called it "Baltum" . 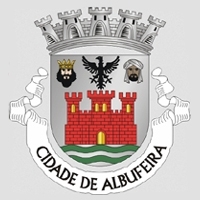 The name of Albufeira goes back to the time of the Moors "Al- Buhera", as the town in the 8th century was an important trading centre. There are hardly any remains from this period, only a plaque to commemorate the former Moorish castle on the upper town. The West was impregnable because of its location on the rocks by the sea. Today there is an interesting Archaeological Museum in the city. Mid-13th century, Albufeira was recaptured by the Order of Knights of Santiago under Afonso III of the Moors. After that, it was for many centuries an insignificant fishing village. The huge Lisbon earthquake in 1755, devastated large parts of the country, and Albufeira was particularly affected. The subsequent tsunami flooded the lower part of the village. This destroyed any significant monuments. The last quarter of the 20th century saw a revival in Albufeira’s fortunes. Its discovery as the main tourist destination of the Algarve marked a huge expansion from fishing village, to town, to city. Today, the hotels and resorts extend almost seamlessly along the beautiful Albufeira coastline. In the summer months up to 300 thousand holidaymakers join the usual 22,000 residents. Actual weather conditions may significantly differ in the various locations due to the winds on the Atlantic coast. Therefore we are publishing more specific and detailed weather data and 72h forecast for selected spots on the Algarvian coast, including wind speed and direction, altitude of waves and rating for surfers as a special service to our visitors interested in water sports. According to our own experience, and based on judgement of the locals, this is the most accurate weather information currently available for the Algarve. The municipality of Albufeira has an area of 140 sq. km which includes the coastal parish of Guia and further inland the parishes of Ferreira and Paderne. In 2011, the population was 40.828, an increase of nearly 10 thousand compared to 2001.